Everyone prayed it wouldn’t happen, but it looks like Stanford Invite will go back to Stevinson, CA, for the second straight year due to heavy rainfall throughout the week. The location change means the tournament schedule could shuffle, too. We could see shorter rounds in rainy conditions. California, here we come. Rain or shine, California’s top talent will cleat up once more this season to test themselves against out-of-region contenders. The caliber of traveling teams has diluted over the last few seasons, and this year only three teams from outside of the West Coast are making the journey. The overall talent at the tournament is still plenty high, but the regional homogenization means Stanford Invite results could have fewer bid implications. It also means Northwest Challenge, which stands to feature most of the division’s best teams from around the country, could have dramatic results very late in the regular season. This weekend has more immediate questions at stake: can anyone stop UC San Diego? How will the Northwest phalanx fare against our new overlords, the Southwest? Just how deep is this Carleton squad? We’ll get some answers this weekend in Stevinson. The #1 UC San Diego Psychosown the division right now despite not having traveled more than three hours from home. They stormed their way through Santa Barbara Invite (13-9 vs UCSB) and Presidents’ Day Invite (11-4 vs UCSB), knocking out competitors like they’re bowling strikes on a Friday night at Kearny Mesa Bowl. If they win Stanford Invite, they’ll be the first team to win the recently-made-up Southwest Triple Crown Tour. The Psychos lacked “big game experience” last year, and they’ve spent 2019 earning it in spades. Last year, Stanford was the Psychos’ biggest mental hurdle at this point in the season. Now Superfly is the no. 2 seed behind the Psychos in Pool A. Stanford will be better stocked to challenge them in pool play compared to their 13-4 game at SBI, but they don’t have the same personnel they did last year to contend with UCSD stars Dena Elimelech, Avery Jones, and Kelli Iwamoto. UC San Diego has talent, chemistry, and a strong system. Most collegiate defenses can only neutralize one of those strengths in a game, and we haven’t seen anyone do it to the Psychos this season. #6UC Santa Barbarahas been everywhere that the Psychos have been, but a few points behind. Their valiant defense and big bet plays are earning them the most success and coverage since their 2011 National title — and no doubt making alum Lisa Pitcaithley proud — but inefficiency has a ceiling. The Burning Skirts huck away break chances nearly as often as they earn them. If UCSB skip the third and fourth caffeine pills on offense after the turn, they could burn through the bracket to meet the Psychos in yet another final. Colorado will be a great defensive rematch for them in pool play, and Washington will be hungry to prove themselves against this fiery team. Stanford Invite will be the biggest test yet for this Burning Skirts team, and even if their hammer count stays high, they’re still a good bet for the semifinals. They don’t seem to care about opponents’ pedigree or star players, and this brand of mental toughness is a harder skill to refine than decision-making or chilly throwing. #3 Carleton Syzygy was down a few players at Queen City Tune-Up, where they nevertheless reached the semifinals to face North Carolina. Carleton is already good, and we don’t even how high their ceiling could be. This Syzygy team is stacked with young talent, recalling past eras when Carleton was the breeding ground for stars. Their roster has three times more freshmen than seniors, and the rookie class is star-studded. Carly Campana and Kate Lanier are future U24 teammates, and Lauren Carothers-Liske has similar elite experience (U20 WJUC 2018). Kennadi Hairston (Franklin) is a longtime Seattle youth star, and both Allegra McKee (Northwest) and Ada Wright (Roosevelt) come from the same stacked Northwest scene. The raw ingredients on this pedigreed team will test their talent against tried-and-true recipes like the Ella Hansen Special in pool play, yet they’re an easy bet to reach the semifinals again this year. The question around Syzygy isn’t how good this team could be, but whether they can reach that peak this season. As the rest of the civilized world descends into chaos around us, know that you can always count on the #7 British Columbia Thunderbirdsto play their first real games at Stanford Invite. Every year, their performance in Fremont (or Stevinson, God help us) is a good barometer of their season. In 2017, their battles against Texas and Stanford foreshadowed the depth that would carry them to the 2017 National final. In 2018, they were strong enough to reach the final, but they couldn’t contend with UC San Diego. Sure enough, they lost in quarters at Nationals to a similarly imposing Dartmouth team. This year’s Thunderbirds still feature stars like Ellen Au-Yeung and Naomi Morcilla, who I could swear have been in college forever. They’ve also added more Canadian youth talent like Catie Akune, Ada Chang, and Julie Lee. UBC doesn’t shy away from plugging rookies into their starting lines, so expect to hear those names often this weekend. As the no. 4 seed, UBC tops Pool D where they’ll need to keep the surging Cal Poly-SLO at bay. Unlike the Thunderbirds, SLO Motion already has three tournaments to their season, and this extended warmup makes them dangerous for our Canadian friends. UBC isn’t at risk of missing Nationals this year — they’ve attended eight of the last 10 years — but this weekend will be a meaningful temperature check for how far they can climb in 2019. #11 Cal Poly-SLO Motion is the early season Cinderella in the Southwest, even if they play more like giant killers. They were only one point away from Nationals last year, and they’re turning that shoulder chip into wins already this season. They’ve defeated Stanford three times already, and they have victories against Colorado, Vermont, and California as well. SLO Motion is building on the tight-knit chemistry and gritty plays they displayed last year, despite losing Caroline Swanson early this season to injury. Diana Swanson commands SLO Motion’s offense in her twin’s absence, and you can feel her field presence even from the sideline. Joined by Thalia Ward, Sherita Li, and freshman Vanessa Beeler, this small team has already proved they’re able to take down top teams, and they’ll have the chance to challenge some of the division’s best, especially British Columbia during pool play. SLO Motion could be the fairy tale program of the season; this weekend will be their chance to step further into the spotlight. #10 Oregon Fugue will return to California to take another rainy crack at the West Coast competition. They were a small yet mighty squad at Presidents Day Invite (5th place), but these women know each other well and they know how to draw mistakes out of offenses like water from stone. 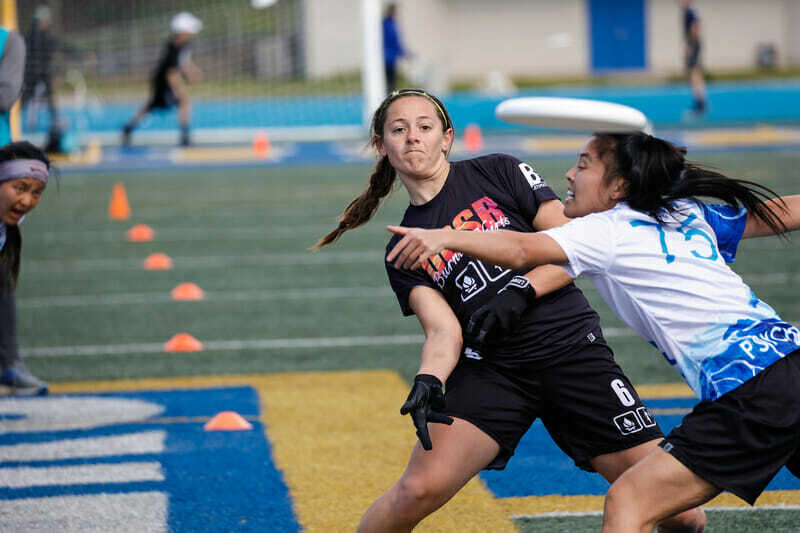 The big throw brand of Fugue “sports ball” is watered down some this year now that Ella Hansen is their only big thrower, but count on Maddie Boyle, Natalie Clifton, and Kaiyana Petrus to work the disc together for a newer era of Fugue ultimate. #15 Washington Element has spent a lot of years pushing their program to improve since their 2012 National title. They’ve done some rebuilding, but much of the team’s struggle has been fitting their talented pieces together. So far in 2019, the elements of their team are finally gelling (sorry not sorry about the pun). Washington went 4-2 at Santa Barbara Invite, where their ceiling seemed high. This weekend will be a good test for Washington against tough defensive teams like UCSB and Colorado, who will push them to attack space and move off the sideline. Veterans Sophie Johansen and Kate Dusenbury are joined by talented freshmen Stephanie Phillips, Peixian Rong, and Ikran Elmi, who have already had an impact on Element’s offensive momentum. #20 Stanford Superfly is coming off a rough Presidents’ Day Invite. They posted a 2-5 record in La Jolla to bring their season record to a 6-8 mark that sits well below program expectations. But while the results were bad, Stanford did show signs of improvement. If Hallie Dunham returns to action, it will be a big boost to the team’s backfield, but, either way, expect Stanford to be better this weekend than they have been in their previous two tournaments. There’s no doubt this year is a rebuilding year for Superfly, but they do have the have one of the best coaching staffs in the country, and as their top end talent is able to return to the field, they should continue to improve all season long. #21 Texas Melee also had a tough time at Presidents’ Day Invite. A stretch of three straight losses to Stanford, UCSB, and Minnesota derailed their weekend. They were able to get the less experienced depth of their roster reps in their opening weekend of the season, though, and that could pay off for them this weekend. Domenica Sutherland and Carolina O’Connell make up one of the most experienced handler pairs in the country, and they have a handful of dangerous cutting options at their disposal, too. The pressure is now on Melee to perform this weekend, considering they find themselves outside of the bid cutoff, but they do have the talent and experience to have a solid bounce back weekend in Stevinson. Melee wasn’t the only South Central team to struggle at Presidents’ Day. #13 Colorado Kali didn’t suffer as badly as Texas did–they made the bracket and registered an impressive win against Western Washington in consolation. But they, too, find themselves on the wrong side of the bid cutoff at present. The two rivals will likely be rooting for each other this weekend, as a one bid region would could cause some serious distress for the two programs that have grown accustomed to being at Nationals. Meg Henderson will be back in action for Kali after missing out on Prez Day, and she should provide a boost for a young team that showed growing pains, but also some reasons to be excited in their first tournament of the season. #24 UCLA BLU were cheated a bit by the weather at Presidents’ Day. They lost their two pool play games, which knocked them out of contention for a bracket spot, and then promptly blitzed their way through consolation. They’ll get a chance this weekend to better prove themselves against the higher end teams of the tournament this weekend. If Malia Smith, Cameron Hastings, and Emily Beck play as well as they did that weekend, they may surprise a team or two this weekend. The California Pie Queens very nearly had a stellar weekend at Presidents’ Day Invite, with one point losses to both Vermont and Oregon in pool play. Their only other loss on the weekend was to the aforementioned UCLA. They’re in a similar boat to their Southwest foes, in that they’re a year removed from Nationals, and coming off a what could have been weekend. It’s a tough ask with such a difficult field, but a big weekend for Cal would go a long way in setting them on the path back to Nationals. Florida FUEL makes the long trek out west looking to continue to cut their teeth for Southeast Regionals. Florida Winter Classic and Queen City Tune Up were collections of mixed results, but the team knows that, in the Southeast, it will be all about being the best team at the end of April. Most of the top players from their back-to-back Nationals teams of 2017 and 2018 are gone, and the team is working in new players into new roles. With the playmaking ability of Gabby Krajniak and the roster’s grit, they could grind out an upset in pool play or maybe rack up a couple of wins in consolation. But this is a team that has its eyes on making Nationals for a third straight year, and racking up a bunch of wins this weekend isn’t necessarily a part of that process for them. One of just two teams in the Stanford Invite field to have played at Stanford Open a couple of weeks ago, UC-Davis fought their way to semifinals. They’ve played UCSB, Stanford, and Cal, losing to each, but this weekend will be a real step up in competition level from what they’ve played in their last couple of tournaments. Comments on "Stanford Invite 2019: Tournament Preview (Women’s)"